Well, it's Friday again. 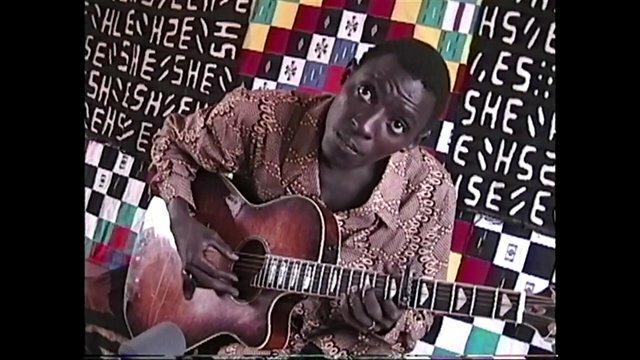 I've been looking around the web for some interesting guitar stuff and came across this video made by Banning Eyre of the African guitarist Aboubacar "Badian" Diabate. I would venture a guess and say that for most of us African guitar music was first introduced into our lives via Paul Simon's Graceland, Johnny Clegg and Savuka or maybe Jonathan Butler. The native sounds and incredible speed in which Badian picks one finger runs is something to watch. His guitar style is certainly a continent away from what we usually see in America. You must throw western musical logic aside to fully appreciate the music he's playing and being a guitarist to appreciate his unique picking. This video of Banning Eyre and Badian is a 15 minute mini documentary on the two of them meeting in the 1990's to a recent reunion where Badian visits the home of Eyre. This is a fun video to watch.